Today, a growing magnitude of pecuniary and human resources are being employed for the digital transformation of enterprises to satiate the need for enhanced customer e-experiences, digital competitiveness, and marketing effectiveness. Adobe has set the cornerstone for digitization by offering tools and services for creating digital content, deploying it across media and devices, along with optimization over time in order to accomplish business growth. Many IT vendors play the important role of providing customers with Adobe solutions such as creative cloud, web experience management, digital marketing, digital media and publishing, online analytics, acrobat, social measurement, and more. Various industry leaders, technologists, and new players with high technical prowess are delivering sales, integration, and training for Adobe products and solutions to customers. Solutions such as Adobe Experience Management, Adobe Analytics, Adobe Campaign, and Adobe Marketing Cloud (AMC) are deployed to facilitate improvement in customer experience and revenue. Such solutions also foster a strong relationship between the Adobe platform and their customers to enhance customer engagement and retention. This edition of CIOReview features startups with expertise in Adobe solutions to inform you about the Adobe technology solutions you can choose from to augment marketing ROI, build better customer relationships, and enhance digital experience across all customer touch points and channels. 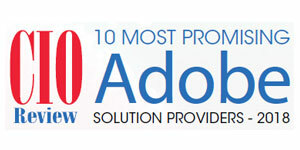 A distinguished selection panel comprising CEOs, CIOs, VCs, and the CIOReview magazine’s editorial board has selected a list of the most promising Adobe solution providers that leverage innovative technologies to deliver the tools, resources, and expertise your enterprise needs to implement the secure and scalable Adobe platform products and services benefitting both your company and its customers.